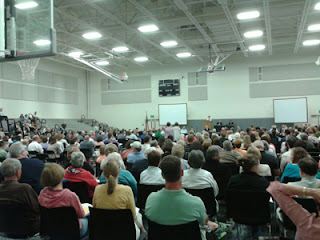 Is our Town Meeting form of government broken? This year's Annual Town Meeting (ATM) was held on May 7 in the gymnasium of the new Longmeadow High School. Having attended many town meetings during the past 33 years that I have lived in town I was amazed to see a new dynamic in play at this last meeting. It seems that the pro-school coalition- a well organized group with an ability to fill any town meeting venue using social media and with direct ties to the School Committee (SC) was determined to increase school department spending in direct opposition to the Select Board (SB) and Finance Committee (FC) recommendations. Prior to the town meeting there had been many discussions between the SB and the SC regarding the level of FY2014 funding for the Longmeadow School Department. The FY2014 budget guideline established by the SB for all town departments including the School Department was for a 0% increase vs. the current FY2013 budget. All town departments except the School Department submitted budgets with 0% increases. The SC approved an increase of $706K citing significant effects on Longmeadow education if they were forced to accept a 0% increase. A compromise budget increase of $353K developed by a joint SC/SB committee failed to gain approval by the full SB. SC members + a large contingent of pro-school advocates rallied their forces and showed up at the May 7 ATM in order to move forward an amendment to increase the SB recommended FY14 School Dept. budget. Article #6 involved the FY2014 budget and was an important article on the 2013 ATM warrant. In the video clip below showing key portions of the ATM (courtesy of LCTV) you will see three different amendments proposed for Article #6. Mr. Gustafson's secondary amendment to Article #6 was obviously done to highlight the potential jeopardy of the process for town meeting members to make proposals without due diligence. SB Vice-Chair Mark Gold also pointed out that approval of amendment #2 (increase by $706K) would be an irresponsible action by the Town Meeting without having identified funding sources first and could lead to some dire consequences with other portions of the town budget. I believe that if SC Chair Michael Clark had not pushed back on the need for the $706K amendment, town meeting members would have approved it. In the end, the School Dept budget for FY14 was increased by $353K. Now that this pro-school special interest group has been successful, it may be emboldened to do more. Don't be surprised to see another attempt to increase school funding at a future town meeting- particularly a fall town meeting when fewer people are in attendance. Voters looking to see that there is balanced spending of their tax dollars between schools and everything else better paid heed to what is happening at town meetings. Better still, they should attend them rather than watching the meetings on LCTV. Winston Churchill once said, "democracy is the worst form of Government except for all those other forms that have been tried from time to time." And so it may be said of our direct democracy, the Town Meeting form of government rooted in the very founding of this town. In a May 19 interview on LCTV, Select Board member Mark Barowsky put forth a different idea, a mayoral form of government in order to put an end to Town Meeting. He further stated he wanted to put the School Committee under the mayor. By changing our form of government, this idea would concentrate power in the hands of a single individual, with the Select Board essentially becoming like a city council. The town manager would be gone. The mayor, armed with a bare majority on the Select Board, could re-make the town every few years, with the voters having no direct say over anything. This call for an elected mayor comes on the heels of the voters' overwhelming rejection of the Select Board's annual budget at Town Meeting. This call for a subservient school committee comes at a time when it is clear that the elected representatives of the School Committee have minds of their own, and that they are prepared to make their case to the voters, and not just to three members of the Select Board. Barowsky's idea does address the momentary political problem of the voters exercising autonomous will and not following the policies favored by Barowsky. Putting the School Committee to heel under a mayor would also solve the problem of that pesky board trying to stop cuts that would increase class sizes and diminish the quality of education in Longmeadow's schools. These benefits are, at best, dubious. The costs of that kind of change to our town charter, on that other hand, are fundamental. In 1774, the tradition of town meetings was considered so sacred that Parliament's act of forbidding them within Massachusetts (part of the "Intolerable Acts") helped lead to the American Revolution. That act is even referenced in the Declaration of Independence as one of the grievances that justified separation from England. To be sure, times and circumstances change, and Town Meeting democracy has been abolished in large cities in New England. And it never took hold in the same way in the South and the West the way it did here in New England. But a tradition as longlasting as our form of town government does deserve respect, having proven its worth in different eras and in crises more grave than any problem currently facing Longmeadow. More problematic is the notion that we must take power away from the people because the people cannot be trusted to make decisions on matters of the town budget and taxation. It is certainly true that voters do sometimes make bad decisions, but there is no greater discipline than having to live with one’s own decisions. Town Meeting has its faults, but there are ways to make its deliberations most robust and more meaningful. Democracy is, and ever will be, an imperfection. The alternative form of government, one with a strong mayor, is not better, as it depends on the strengths and frailties of a single human being, rather than the checks and balances contained in our town charter. A mayor, as Holyoke learned, can reverse course on an important issue like casinos, and suddenly, a casino is on the table. And who exactly would be this mayor? Is there any town politician in recent memory whose wisdom and judgment was so esteemed that he or she would be worthy of such a powerful office? If none comes to mind, then this mayor idea should give town residents pause. The experience of our larger neighbors in western Massachusetts proves that mayors can be a hit-or-miss proposition. A recent mayor of Agawam made more headlines for extra-matrimonial scuffles than for forward-thinking policies. A single bad Select Board member can do little lasting damage. A strong mayor with a school committee in his or her back pocket is an extreme solution for extreme problems, like when Chicago turned to Richard Daley as its savior. Taking such an exceptional step, and in the process, overturning centuries of political experience, is hardly warranted for losing a vote on a town budget. Alex J. Grant is a lawyer living in Longmeadow. His email address is alex.grant68@yahoo.com.